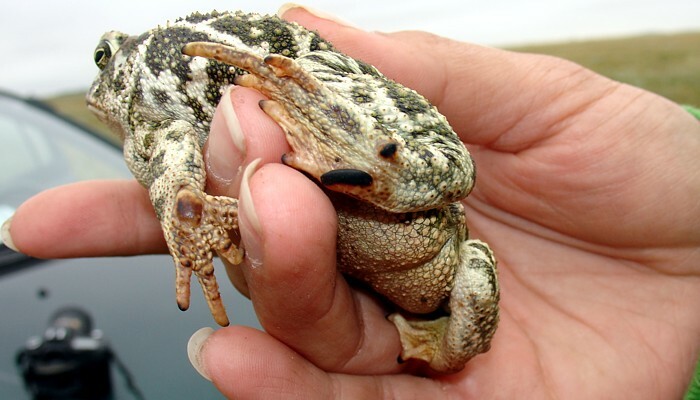 The genus: "Bufo" no longer is used for a number of North American members of the Bufonidae, they are now included in the genus: "Anaxyrus". 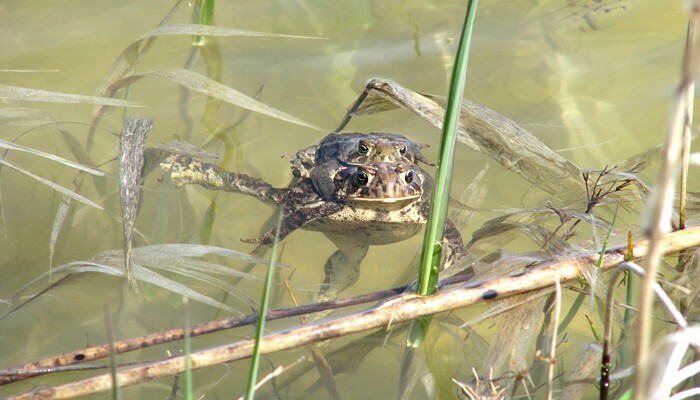 Manitoba's four toad species belong to two families, three to the Bufonidae (Canadian Toad, American Toad and Great Plains Toad) and one to the Pelobatidae (Plains Spadefoot Toad). 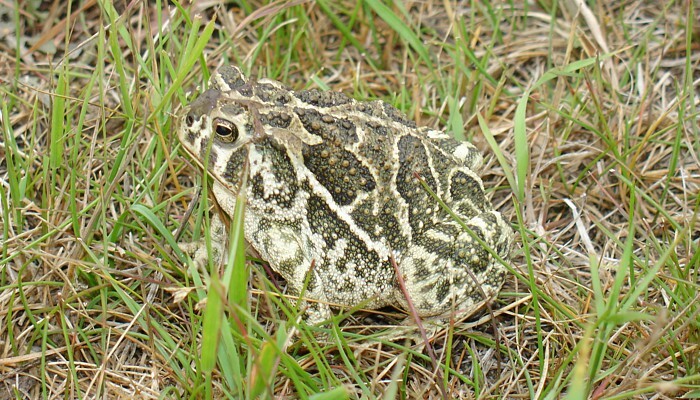 Two toad species, the American and Canadian Toads, have extensive ranges in Manitoba and are quite common. The other two, the Great Plains and Plains Spadefoot Toads have limited ranges in the southwest of the province. There are few records for the latter two in Manitoba, so they are of particular interest to this project. Current conservation rankings by the Manitoba Conservation Data Centre are included here. For explanations of the ranking terminology: Click Here. 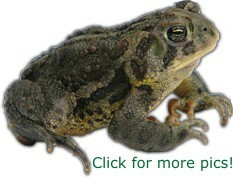 Description: A large toad, up to 11 cm body length. Body colour is tan to light brown with many darker brown or reddish blotches. The dorsal skin is rough and warty. Larger blotches on the back usually have one or two large warts. The belly is tan to cream-coloured. This species can be difficult to distinguish from the Canadian Toad. The spots and blotches tend to be smaller in the American Toad with fewer warts in them. Habitat: Forested uplands and the margins of lakes and wetlands. 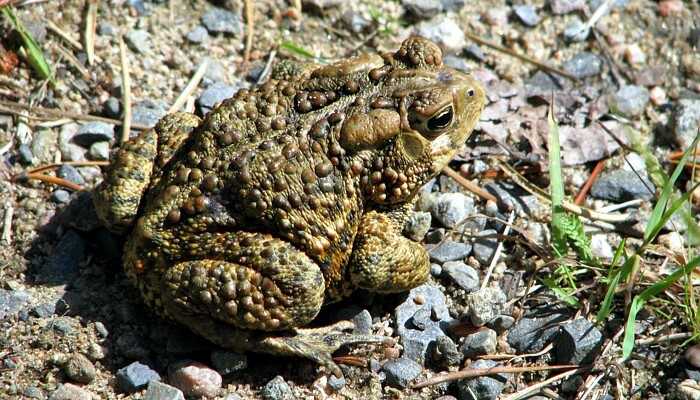 Status and Range in Manitoba: The American Toad is considered widespread and abundant (S4/S5) in the province. It occurs from the southeast corner of the province to east of Winnipeg, then northward in a band along the east side of Lake Winnipeg to at least the north end of the lake. Current Range Map for the American Toad. Life Cycle: Males call in mid to late May in southern Manitoba. 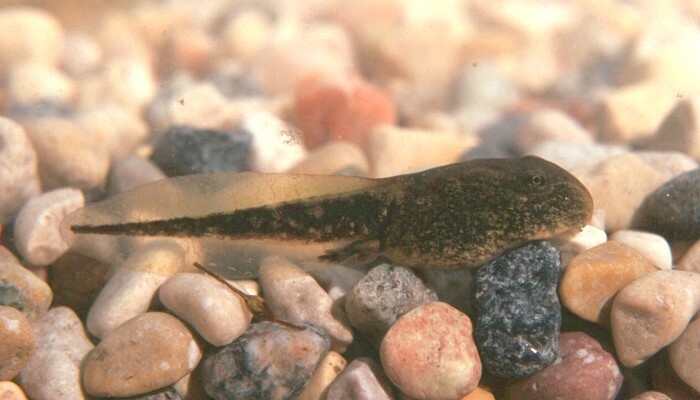 Eggs laid by late May hatch in only a few days and larvae develop rapidly, transforming to tiny toadlets (only 1 cm body length) in 6 weeks, by early July. 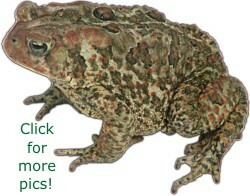 Hear the American Toad mating call: Your browser does not support the audio element. Tips on finding this species: Listen for males calling in mid to late May, later further north. The best time to hear them is evening, but they may call throughout the day. In general, toads are most active at night. Look for them with a flashlight along roads or beaches. 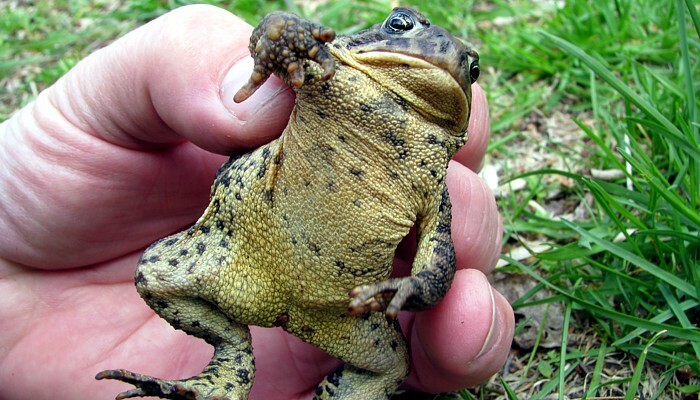 Special Note: The Canadian Toad was once considered to be a subspecies of the American Toad. Now they are considered to be distinct species, but they are thought to interbreed where their ranges meet in southern Manitoba, east of Winnipeg. 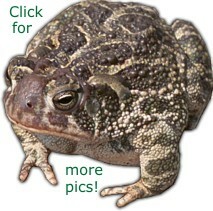 Description: A large toad, up to 8 cm body length. 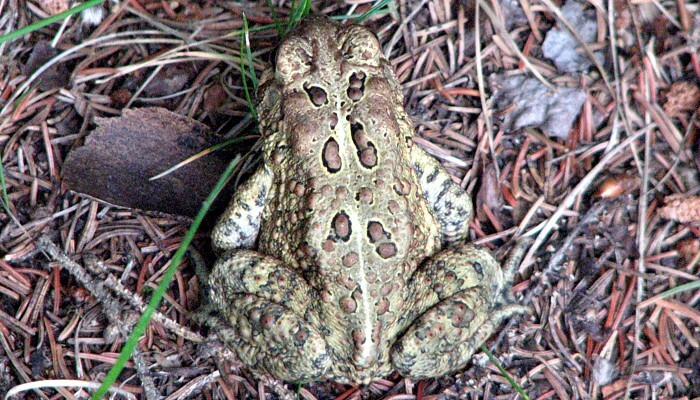 Similar to the American Toad in colouration, tan to light brown with many darker brown or reddish blotches. The dorsal skin is rough and warty. Blotches on the back are larger in this species and usually have smaller, but more numerous warts. The belly is tan to cream-coloured. 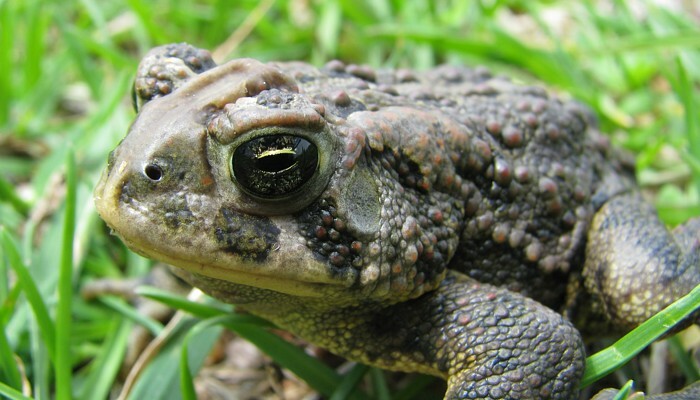 The Canadian Toad has a raised area between the eyes, called a boss, while the American Toad has two lower ridges that form a "V" between it's eyes. Habitat: Grasslands, forest edges and the margins of lakes and wetlands. 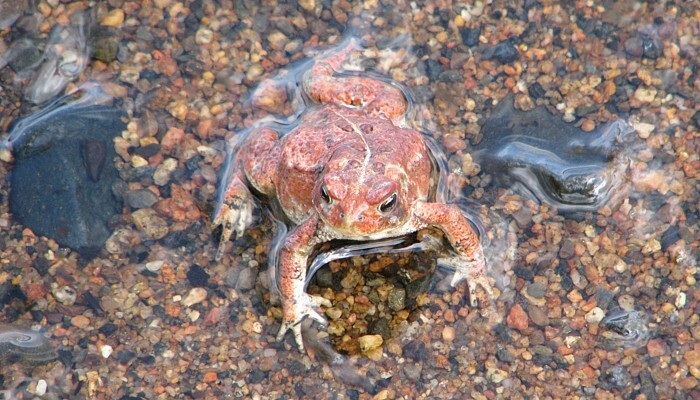 Status and Range in Manitoba: The Canadian Toad is considered widespread and abundant (S4/S5) in the province. It occurs in the southeastern third of the province, through the Interlake region to the Saskatchewan border and northward to the edge of the boreal forest. Current Range Map for the Canadian Toad. Life Cycle: Similar to the American Toad. Males call in mid to late May in the southern part of the province. 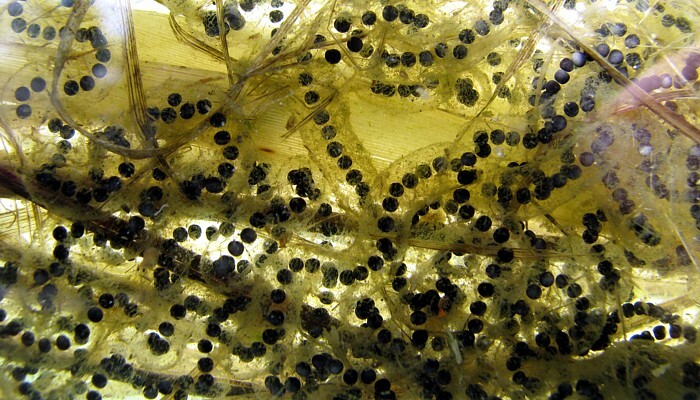 Eggs laid by late May hatch in only a few days and larvae develop rapidly, transforming to tiny toadlets (only 1 cm body length) in 6 weeks, by early July. Hear the Canadian Toad mating call: Your browser does not support the audio element. Tips on finding this species: Listen for males calling in mid to late May. The best time to hear them is evening, but they may call throughout the day. Toads are most active at night. Look for them at night with a flashlight in open areas near wetlands. 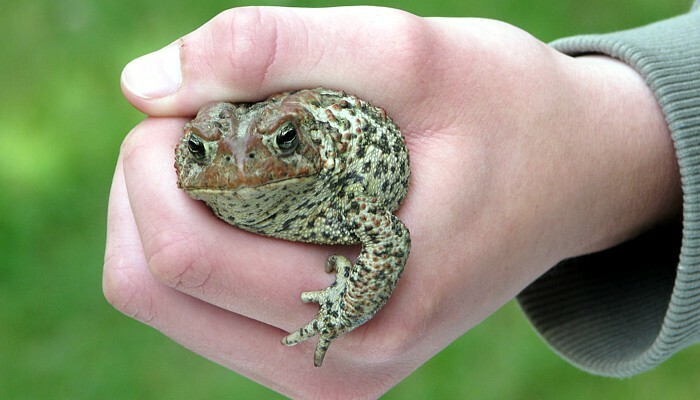 Description: A large toad, up to 11 cm body length. Similar to the above two species, tan to light brown, but with the back dominated by large darker coloured or even greenish blotches. The large blotches are boldly bordered. The dorsal skin is rough and covered in small warts. The belly is tan to cream-coloured. Habitat: Grasslands and the margins of wetlands. 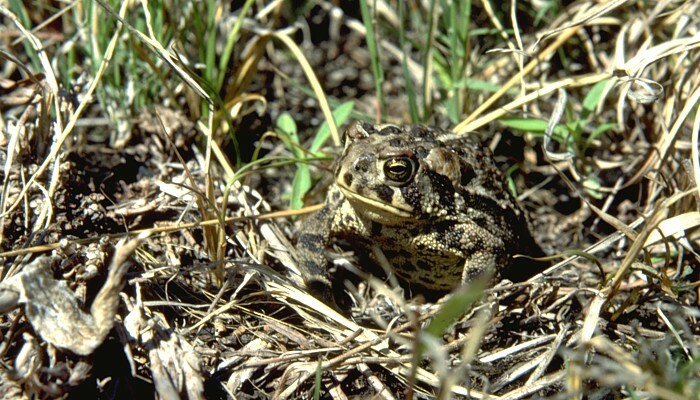 Status and Range in Manitoba: The Great Plains Toad is considered rare or uncommon (S2) in the province. 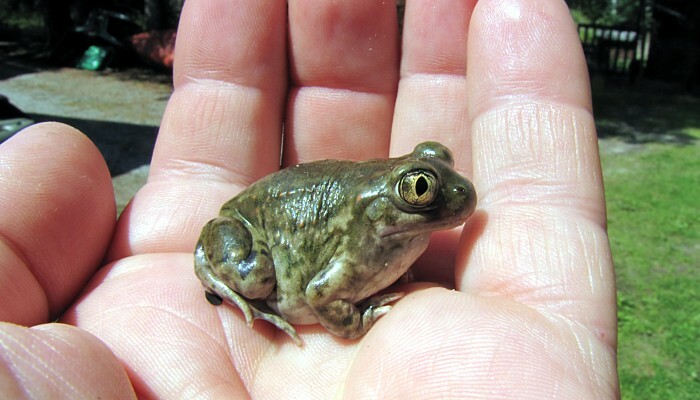 It is the only amphibian in Manitoba listed as Threatened (See Manitoba Conservation's Species at Risk). It is only known from the extreme southwest corner of the province. However, it's range in northern Minnesota and North Dakota suggest it may occur in southeastern Manitoba, too. Current Range Map for the Great Plains Toad. Life Cycle: Males call in late spring or early summer after heavy rains. Eggs are usually laid in large temporary puddles. Eggs hatch quickly and larvae develop rapidly, transforming to tiny toadlets (only 1 cm body length) in as little as 3-4 weeks. 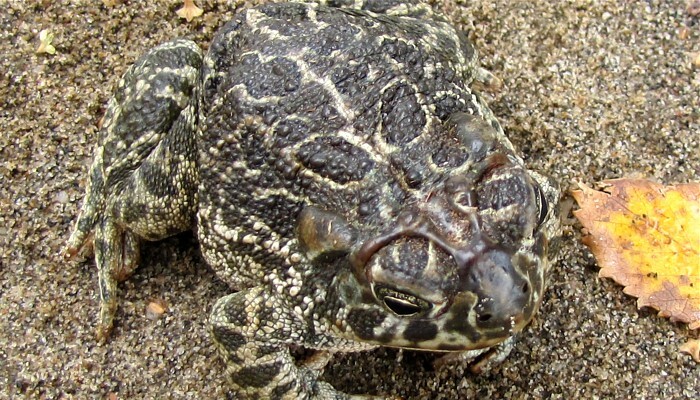 Hear the Great Plains Toad mating call: Your browser does not support the audio element. Tips on finding this species: Listen for males calling in late spring or early summer after heavy rains. The best time to hear them is evening, but they may call throughout the day. Like other toads they are most active at night and can be observed by flashlight in open areas. 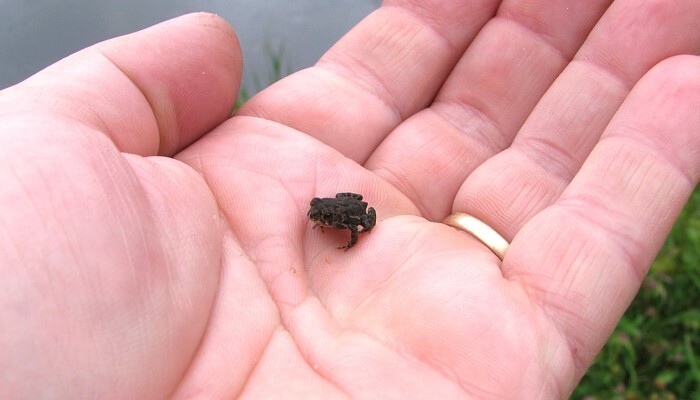 Description: A small toad, up to 6 cm body length. Sandy coloured with light brown or olive markings and small red tubercles. It lacks the warty skin of our other toads. In bright light its pupil is vertically elliptical, like a cat's eye. There is a large black tubercle, its "spade", on the bottom of the hind foot which aids in digging into sandy soils. Habitat: Grasslands with sandy soils. 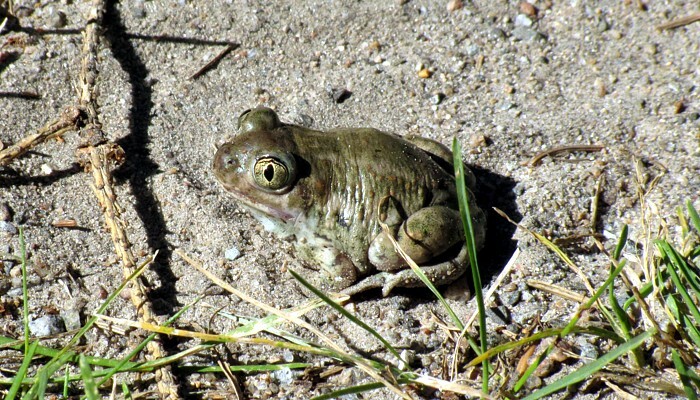 Status and Range in Manitoba: The Plains Spadefoot is uncommon within its limited range in the southwestern corner of Manitoba (S2/S3). 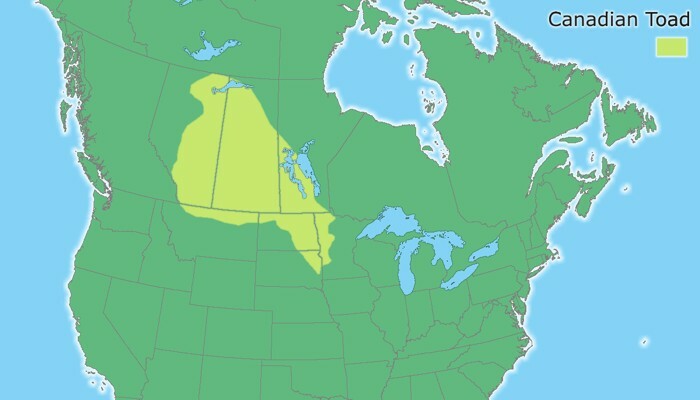 Current Range Map for the Plains Spadefoot. 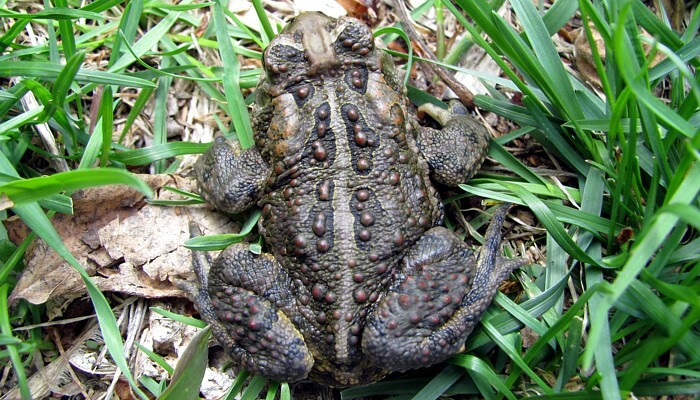 Life Cycle: Like the Great Plains Toad, males call in late spring or early summer after heavy rains. 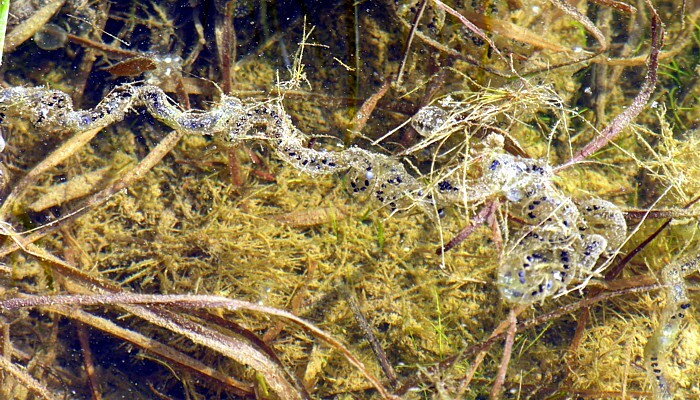 Eggs are usually laid in large temporary puddles. 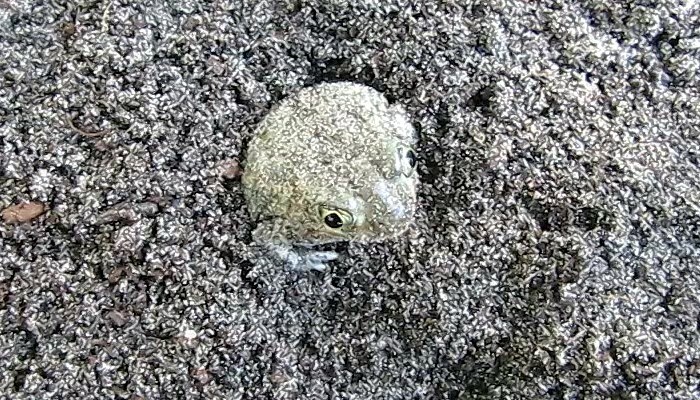 Eggs hatch quickly and larvae develop rapidly, transforming to tiny toadlets (only 1 cm body length) in as little as 3-4 weeks. 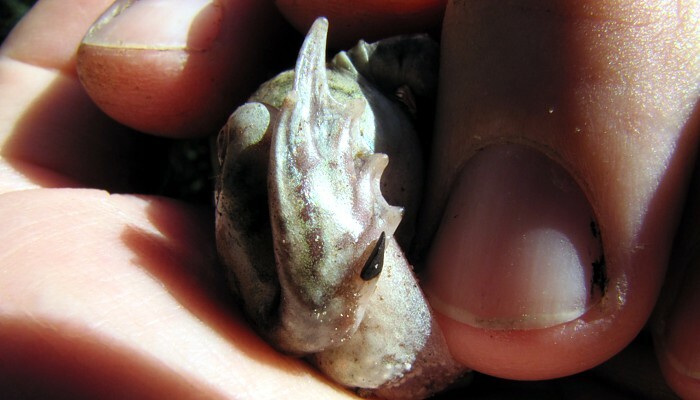 Hear the Plains Spadefoot mating call: Your browser does not support the audio element. Tips on finding this species: Listen for males calling in late spring to early summer after heavy rains. The best time to hear them is evening, but they may call throughout the day. These toads remain underground during the day, only emerging at night to feed. In dry spells they may remain underground for lengthy periods, so watch for them after heavy rains.